GG-Force Investments, LLC & Gregg Racing, Inc. Racing Experience: As a Crew Member since 1991. In 1996, Gregg received his Federal Mogul Dragster license and in 1998, his Advanced ET license (Required To Drive The Pro Mod). Biography: Gregg’s passion for Drag Racing began early in life. In the late ‘60’s, his father drove a front engine dragster. Of course, all dragsters were front engine in those days. The sights, sounds and smells of burning rubber were the beginnings of the “incurable disease” that Drag Racing represents to him today. In 1991, Gregg had the opportunity to become a crew member on a Top Alcohol Funny Car. Here, his decision to make Drag Racing a career was cemented. Gregg says, “In those days, I couldn’t afford two ply toilet tissue, but I knew that some day, Drag Racing would be my career.” Beginning with a tool collection that consisted of an old hammer and a rusty “Crescent” wrench, he couldn’t afford all that was involved in having a race team. To maintain motivation toward his goal, Gregg would make small consistent steps, and tell everyone he knew that some day, he’d have a race car and team. He would purchase one or two tools every payday. Predominantly symbolic, these consistent steps did serve to keep him focused on his long range goal. The accomplishments achieved to date speak to his perseverance. Over the years, he had the opportunity to work on many alcohol cars, including in 1995, Rick Henkleman’s Division 6 champion Top Alcohol Funny Car. 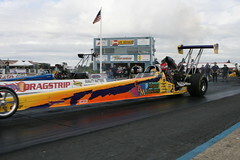 In 1996 Gregg partnered with Russ Parker in a Top Alcohol Dragster. This was the first car Gregg licensed in. In 1997, Gregg was given the opportunity to drive Dave Henderson’s Pro Mod car which they campaigned together in the West Coast Pro Mod Association (WCPMA) during the 1998 season. Gregg purchased the car from Dave at the conclusion of the ’98 season and this is the car he campaigned through the 1999 season. 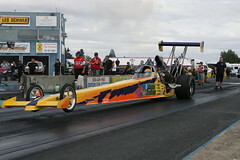 In July ’99 Gregg and the team were in Mission, BC, Canada with the West Coast Pro Mod Association. On what was then a career best pass of 6.76 ET at over 203 MPH, Gregg experienced equipment failure and lost his parachutes as soon as they deployed. Not able to stop his Hot Rod in time, he went into the sand trap at the end of the track and hit the safety catch net at over 110 MPH. Although the net stopped the car 10 feet before an embankment leading down to a river, the car was heavily damaged. Gregg was uninjured except in his pocket book. Demonstrating his relentless passion for the sport, Gregg was ecstatic at the news of running a career best, and spent the balance of the day signing broken pieces of fiberglass from the race car for fans. 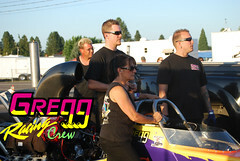 Demonstrating his resilience and perseverance, 30 days and nights of very hard work and $20,000 (highly leveraged) dollars later, Gregg and the team returned to competition at the next race in the WCPMA series in Boise, Idaho. In 2000, Gregg decided to “step up” in his racing career and struck a deal to purchase the “In-N-Out Burger” A/ Fuel Dragster from Jerry Darien that he and his driver Melanie Troxel had campaigned to a number 2 in the world finish the year prior. 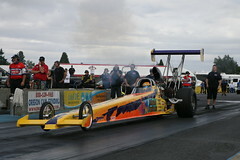 Although it was late in the year by the time all of the pieces came together, he and the team did make an NHRA Division 6 race in Medford, Oregon where he qualified number 4 (out of 12 cars that were in attendance) and made it to the semi-final round of competition. 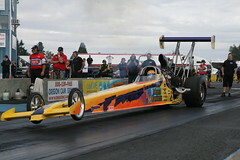 During the 2001 Season, he and the team have defeated the 4 time world champion Rick Santos in Boise, Idaho by running a then career best 5.480 ET at 262.77 MPH, setting the track MPH record in the process. They made it to the final round at that race. In Mission Canada, the team qualified #2 (out of 13 cars in attendance) with a 5.385 ET. During Eliminations, they ran their 3rd career best of the weekend, a 5.373 ET at 265.72 MPH. 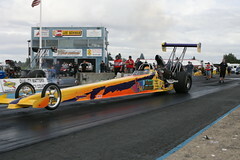 He has made a long term commitment to the NHRA’s Federal Mogul Dragster class with his injected Nitro burning dragster. Owing to the heritage of the car and his passion to succeed, a Division 6 championship and a top 10 national finish are inevitable. Gregg believes that the best use of his passion is to share the thrill of professional Drag Racing with others via a marketing campaign for a team partner/sponsor. Gregg definitely has the “incurable disease” of being passionate about sharing his racing with others. 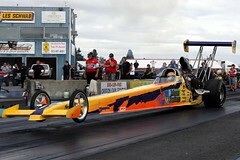 Those who ask Gregg about his Drag Racing come away with a clear picture of how passionate he is about what he does. They often describe him as “Always Going Mach 9 With His Hair On Fire” or “Up On The Tire” in both his aggressive driving style and in general conversation about his Drag Racing. He loves to share his unique Hot Rod and racing operation. Gregg’s level of passion is indeed rare. Put him to work for your organization and let he and the team exceed your expectations as well.